Sri City, May 26, 2018:- The Ambassador of Japan to India, His Excellency Mr. Kenji Hiramatsu visited Sri City on Saturday. Mr. Ramesh Subramaniam, President, Sri City Foundation extended a warm welcome and briefed him on the salient features of the mega industrial park, and the investment opportunities, and highlighted the specific advantages of doing business in Sri City. The Ambassador had an interactive meeting with the CEOs of the Sri City based Japanese industries. Mr. Kiyoshi Furuhashi, Counsellor (Economics), Embassy of Japan and Ms. Shiho Bamba, Counsel, Consulate General of Japan were also present. They went round the industrial park and visited the production units of Isuzu and Unicham. 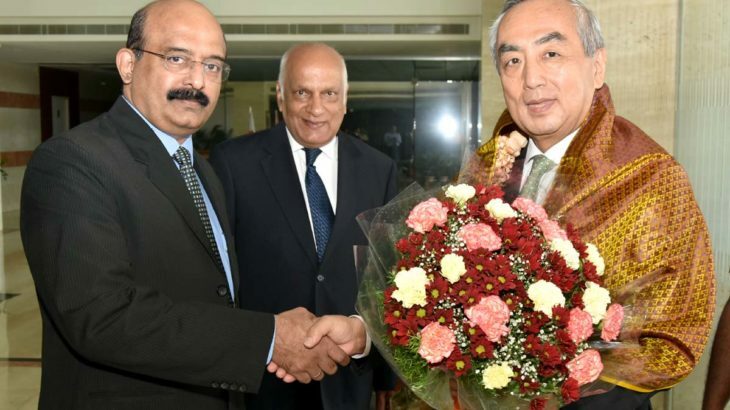 As of now, with the presence over 20 companies from Japan, Sri City emerged as the second most preferred Japanese Industrial Township in the country, next to Neemrana in Rajasthan. The cumulative investment by all these industries totals to over Rs. 8750 crores, creating employment opportunities for about 8500 persons.